One thing I do not miss about parenting a younger child is the diapers. My daughter was tough to get out of diapers, I think partly because she is a highly sensitive child (so it took a REALLY LONG JOURNEY). I was over the moon when she finally said she was ready to say goodbye to them. There are a great many issues around green diapering, and whether there are any really “green” disposable diapers. Especially when you consider that big-brand diapers are made with pesticide-treated fibers, and toxic chemicals to dye them white, as well as other chemicals to keep your baby “dry” in their diaper. (Many of these same issues arise with feminine hygiene products.) Seventh Generation is a company that produces a greener alternative for disposable diapers, along with other green products. 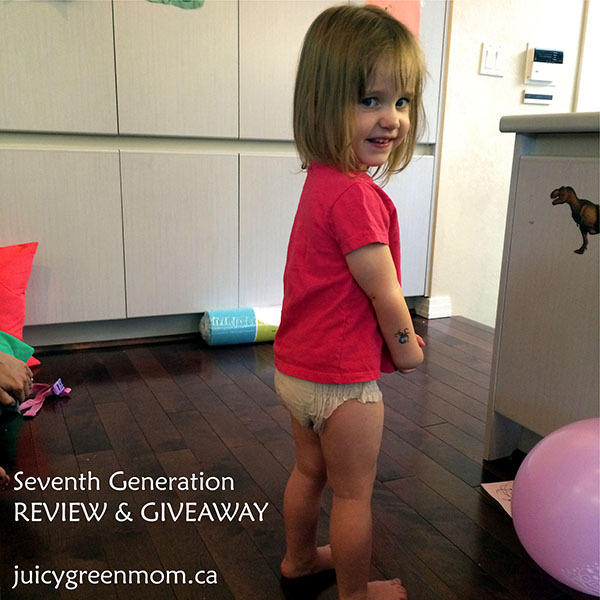 I had the opportunity to receive a package of Seventh Generation products to try out, which I shared with a good friend of mine who has a 2-year-old, who we will call Little B. Here’s what we thought of the products. This dishwashing liquid is non-toxic, plant-based, biodegradable, with no dyes or synthetic fragrances, and clinically proven to be hypoallergenic. The bottle is also made from 100% recycled plastic. We found that it was great for cutting through grease and getting our dishes clean very easily. My only qualm with this is that it does contain sodium lauryl sulfate, which is an ingredient that I typically avoid because it is an irritant. Rating: 3.5/5 because of the SLS ingredient. These wipes are super sturdy and towel like, much like the baby wipes. They don’t fall apart at all, and are very juicy so you can get a lot wiped down with just one wipe! They really do disinfect and are effective against cold/flu viruses. Thymol is the active ingredient (and I do know that Thyme oil is great for killing bacteria). My only issue with these is that again, they contain sodium lauryl sulfate, like the dishwashing liquid. Rating: 3.5/5 because of the SLS ingredient. 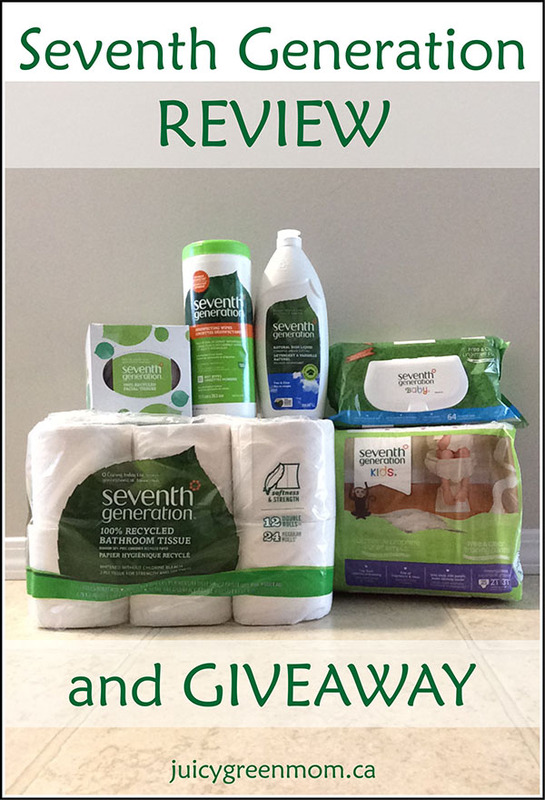 Seventh Generation is going to send one lucky Canadian reader the same prize pack I received for this review (value of $50CAD)! Giveaway open to residents of Canada only. 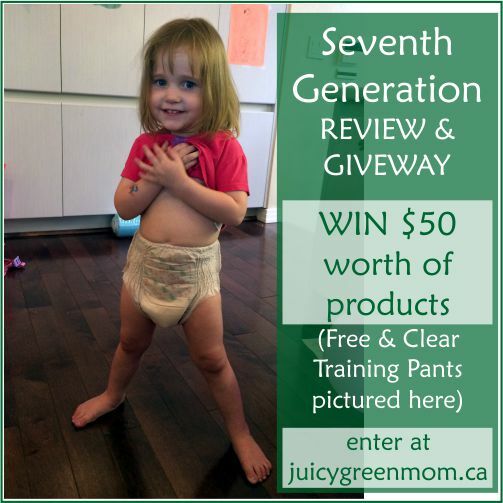 Did this Seventh Generation review help you decide if you want to try any of their products? I’d love to try the dissinfecting wipes! I’m most interested in trying out the Seventh Generation Disinfecting Wipes. We’ve been using wipes a lot lately, but haven’t settled on a brand we like yet. I’d like to try the dishwasher detergent. I’ve used the toilet paper before and it is good. I’d like to try their dishwashing liquid. I don’t mind the SLS for dishes and I think it’s good to have a lot of bubbles as then I’ll use less product. If I win I’ll donate the trainning pants to a coworker and hopefully introduce someone else to sustainable products! Such a great idea to share the love!